For many people, the fear of flying stems from being in a situation where we feel out of control. What compounds the fear is that many of us do not do it often enough (i.e. once or twice a week) to get over the anxiety and discomfort that it evokes in us. It is worth remembering that this is why it can disturb us – we do not like being uncomfortable physically, emotionally or psychologically, and we tend to embrace unhelpful safety behaviours in pursuit of comfort, but unfortunately these strategies tend to work against us in the long run. Fear of flying can also be viewed as a phobia - a phobia is an intense fear of something that, in reality, poses little or no actual danger. Common phobias include closed-in places, heights, highway driving, flying insects, snakes, needles and areoplane travel. 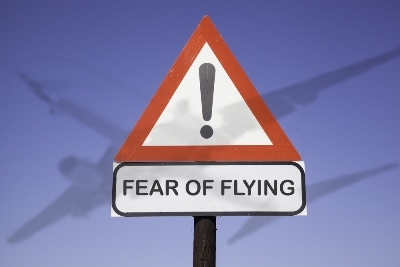 Everyone who has a fear of flying has a specfiic fear that needs to be addressed (i.e. a fear that they have conjured - e.g. a fear of death - but this may not necessarily be death itself, but rather "how" one dies). Regardless of the specific fear, it needs to be addressed in detail, and a CBT therapist can help with this. In the meantime, there are some tips that may help to turn the level of discomfort down. Some tips to "feel the discomfort & fly anyway" - in other words: increase your frustration tolerance with the help of a flight kit / plan. The key to increasing our ability to cope with air travel is to become our own “aviator”. In other words, designing a bespoke toolbox – a toolbox that caters for our particular discomforts and also works to increase our tolerance. There are a number of tools, remedies and rituals that can help people to increase their capacity to cope with the discomfort of flying (e.g. taking medication, familiarizing ourselves with all the sounds and functions of the plane, watching films, sleeping, listening to music, and so on). First, try to take ownership of your decision to fly (i.e. take responsibility for your choice to fly). We tend to adopt the attitude: “I had no choice, my job depends on it” - but we need to be aware that this is still a choice. We can choose not to fly, but it may impact on our ability to compete in the job market, and that would bring a whole list of other discomforts, so we choose to fly. We are not happy about it and we would even prefer not to. So, let’s not disempower ourselves via the blame game. Accept your choice. Accept a level of discomfort. Once you have acknowledged your choice to fly, try to be realistic and accept that you may experience a level of anxiety, but commit yourself to turning the volume down on the level of discomfort. You will not be at “zero” with your comfort level, but if you commit to your routine you will help to turn the overall volume down. You will need to get used to practising a minimum of 5 minutes of meditation each day. You will use this on the day of the flight, at the airport and during the flight; it will help to change your focus and to develop a quieter mind, promoting calmer emotions. Prepare a flight pack, including some in-flight entertainment. This may include an iPad with your favourite music, cross word puzzles, some favourite reading material, sudoku, mints or something to help soothe; perhaps an Aesop travel kit (essential oil roll-ons), cream, rosewater spray, eye mask, ear plugs, magazines, stress ball, soft pillow, comb, deodorant, and a roll-on aromatherapy fragrance – lavender is particularly relaxing. Dress in loose fitting clothing, soft cotton materials that breathe and comfortable shoes. It can also help to have a small soft pillow. Focus on the arrival not on the journey. Even if it’s business, attempt to focus on what you have to do at your destination and attempt to not over think the journey itself. Try to not over think it, have a plan and stick to it, accept some anxiety as "a given" and turn the volume down, attempt to normalize the experience (adopting an attitude that is helpful, commonsense and not over thought or over analyzed). Then it’s 'in the doing' as exposure helps to normalize and take the power out of it. Notice how you've learned to manage anxiety in other situations – remember the first time you went on an underground train, or perhaps the first time you drove a car or cycled on a bike, or something similar – those kinds of skills are just the kind that you'll be applying in this situation. It's helpful to remind yourself how little anxiety is provoked now by lots of situations that used to cause you great discomfort. Fear of flying can be a debilitating experience and that's why it's worth addressing it in a treatment, which has a strong evidence-base, like CBT.